The 7.5-by-11 metre screen would hang from the 16th to the 18th floors of the building. A giant media screen in downtown Vancouver that would be lowered each night to feature the work of local artists will be up for discussion at an open house Wednesday night. 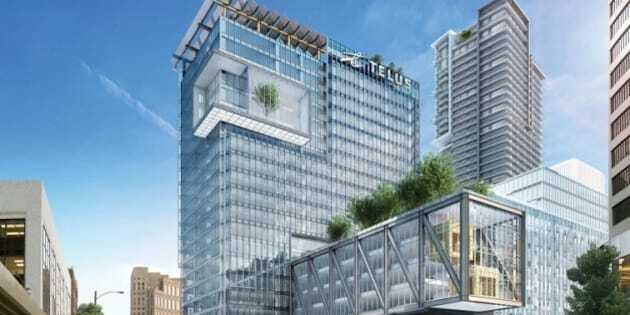 The developer finishing the new Telus Garden says the 7.5-by-11 metre screen would hang from the 16th to the 18th floors of the new building on 520 West Georgia Street. "It&apos;s really just a vehicle to display culture-rich content into the downtown fabric," Rhiannon Mabberley of Westbank Projects told The Early Edition&apos;s Rick Cluff. The screen still requires approval from Vancouver city hall, where council recently voted in favour of a new initiative to limit outdoor light pollution. Public hearings will also begin in the spring. Mabberley insists the screen will not feature ads, and it would not bother people living downtown because it will be powered by backlit projection. But David Cookson, a renewable-energy specialist who has spoken against the lighted billboard at B.C. Place, says he&apos;s concerned for residents living near Telus Garden. "These poor residents that are at The Hudson, that are one block away, are about to have their lives changed forever," he said, adding that even he and his family, who live five blocks away from B.C. Place, are bothered by the "giant Budweiser ads" flashing from the screens at the Terry Fox Plaza. The media screen open house takes place at the Westin Grand Hotel in Vancouver from 5 to 8 p.m. Wednesday night.